I am back from my little vacation and my trip to Chicago to see Drive Like Jehu. Both times I saw Jehu were incredible and I'm so glad that I managed to go to those shows. It was also great to see loads of friends from around the country who had also come out for the shows. It was a truly great time and I hope I see everyone again really soon. I can't say that I did a ton of record shopping while I was in town, but I did hit up two new stores. The first of which was called Bric-A-Brac Records. Located in Logan Square, it's a medium sized shop, but they sure have crammed a ton of stuff in there. While I didn't buy anything (I was traveling pretty light and needed to keep it that way), that had a good selection of rock and roll. 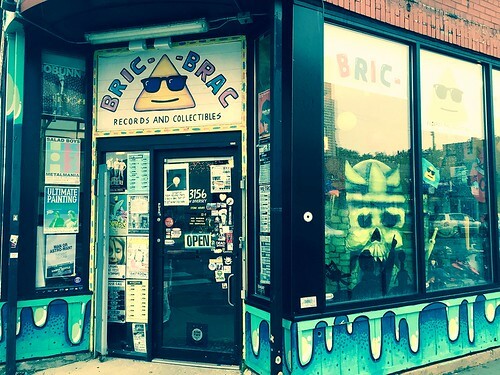 As a whole I guess you could say they lean towards the garage-ier type stuff, but I saw plenty of neat things from all genres digging through their 7"s.
The thing that actually makes this the sort of shop I really wish we had in New Jersey is that they also sell vintage toys. The toy section is pretty small in comparison with the records, but they had a lot of great stock. In particular they had quite a few of the old Kenner Ghostbusters toys and a ton of He-Man. The prices seemed pretty reasonable to me, but again, I wasn't really set up to be buying a bunch while in town. Absolutely a store worth sticking your nose in if you are in Chicago. Century Palm - White Light 7"
Mother's Children / Mandates - Split 7"
Collection: Drive Like Jehu LPs & 7"